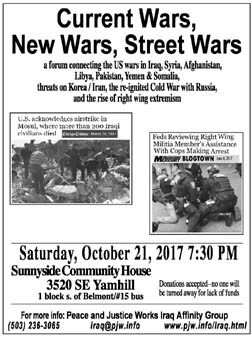 "Current Wars, New Wars, Street Wars"
Peace and Justice Works Iraq Affinity Group is hosting a forum titled "Current Wars, New Wars, Street Wars" on Saturday, October 21 at 7:30 PM at Sunnyside Community House, 3520 SE Yamhill (one block south of Belmont, #15 bus). The forum's goal is to connect America's ongoing wars (in Iraq, Syria, Afghanistan, Libya, Pakistan, Yemen and Somalia), the new threats of war (with Korea, Iran and Russia) and the rise of right wing extremism and violence in the streets at home. The event is free but donations will be accepted at the door. There will be five short presentations on the main topics followed by a Q&A session. This event is being funded in part by the Jan Bone Memorial Fund for Public Forums, but please consider making a donation to the Iraq Affinity Group to support this important forum. Send a check to PO Box 42456, Portland OR 97242 or follow the "Donate" button on the website. Note: There is wheelchair access to the space at Sunnyside Community House, but it requires one of our volunteers to open extra doors, please let us know ahead of time if you will need assistance. For more information contact Peace and Justice Works at 503-236-3065 or iraq@pjw.info.